0:30 AM PT -- Law enforcement sources tell TMZ ... cops spotted Woods "driving erratically, all over the road" when they pulled him over. We're told the officer smelled alcohol on Woods' breath and at that point Woods became "arrogant." We're told the officer asked him to blow into a breathalyzer but he refused. In Florida that means automatic arrest and license suspension. Our sources say Woods' people have been calling the police all morning asking if the cop had a body cam. 9:45 AM PT -- We're told Woods was driving a 2015 Mercedes. Cops called a tow yard to store the vehicle but then cancelled the call. Someone involved tells us a person in Woods' camp retrieved the vehicle. 9:40 AM PT -- Unclear if it's related, but Tiger had back surgery last month. As we reported, cops have not specified whether the DUI was for drugs, alcohol or both.Tiger Woods has been arrested on DUI charges in Jupiter, Florida. The golfer was stopped by cops early Monday morning for driving under the influence of alcohol or drugs. He was taken in around 3 AM and released from Palm Beach County Jail at 10:50 AM. 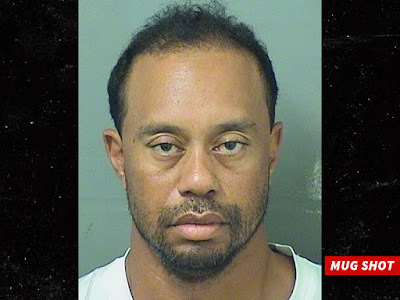 You'll recall ... when Tiger and then wife Elin Nordegren got into their blowout fight back in 2009, he hit a tree while allegedly driving under the influence of Ambien. He was not charged with DUI at the time.